In recent weeks I have been busy preparing some of my artwork to be included in a show. There was a relatively short deadline to prepare the work to be ready to hang. I thought it best to frame the work, and decided to make the frames myself. This marks the third time I have built my own frames. Every time I make a frame, I try to learn a little about how to improve the process the next time around. This includes the proper tools, although I would stop short of spending the small fortune needed to build a professional framer's tool kit. This time around, I used a hand miter saw, equipped with a fine Japanese blade, to do my cuts. 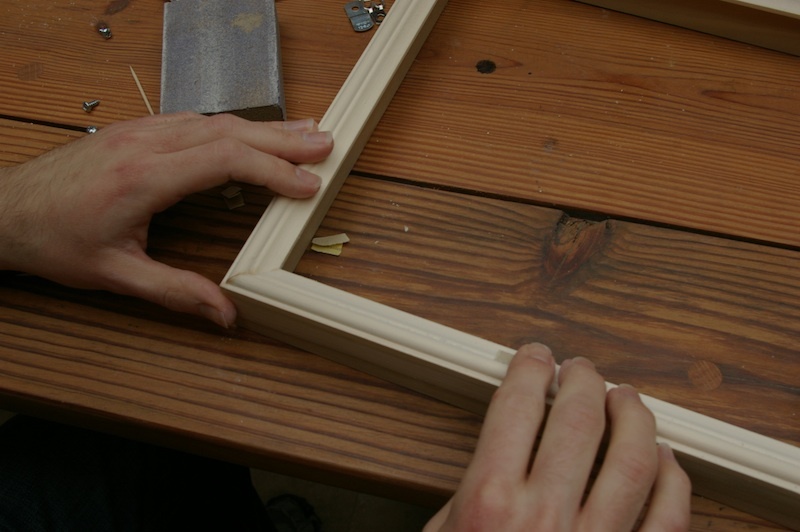 This produces finer and truer cuts than the table-saw method I used for earlier frames. A small amount of touch up work around the seam is still necessary. 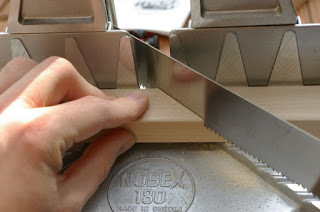 Here I am using the new saw to cut a miter into one of the frame pieces. My hand is there to offer up some extra support. After a frame was glued together and touch up work was complete, the frame was given a fine sanding. Finally, paint will be applied to suit.